Sensotronic Brake Control (SBC) ABS pump systems are commonly found on higher end Mercedes such as the E-Class, SL & CL Class, CLS etc.. the SBC Sensotronic ABS pump is a brake-by-wire system and Mercedes Benz were one of the first vehicle manufacturing companies to apply this system to cars. The Brake-By-Wire Sensotronic Brake Control (SBC) system is quite different to the conventional hydraulic abs braking system because it doesn’t have a brake servo at the reservoir to start with and the brake pedal is connected to the ECU by wire. The sensors on the brake pedal offer a way of communication, telling the on-board computer how the brake pedal was pressed, how hard it was pressed & how quickly it was pressed etc. The computer then calculates the required pressure and activates the braking system producing braking force at each wheel via modulators. The Sensotronic Brake Control (SBC) ABS Pump has a service life (also known as a life expectancy) programmed into the control module which works off the number of brake actuations. Once this limit has been reached, the Sensotronic Brake Control (SBC) light may illuminate on the dash or a brake related warning may appear on the trip computer. Once this happens, the Sensotronic Brake Control (SBC) system is de-activated and the hydraulic braking function mode is activated whereby limited braking pressure is applied to the front brakes thus increasing the braking distance. 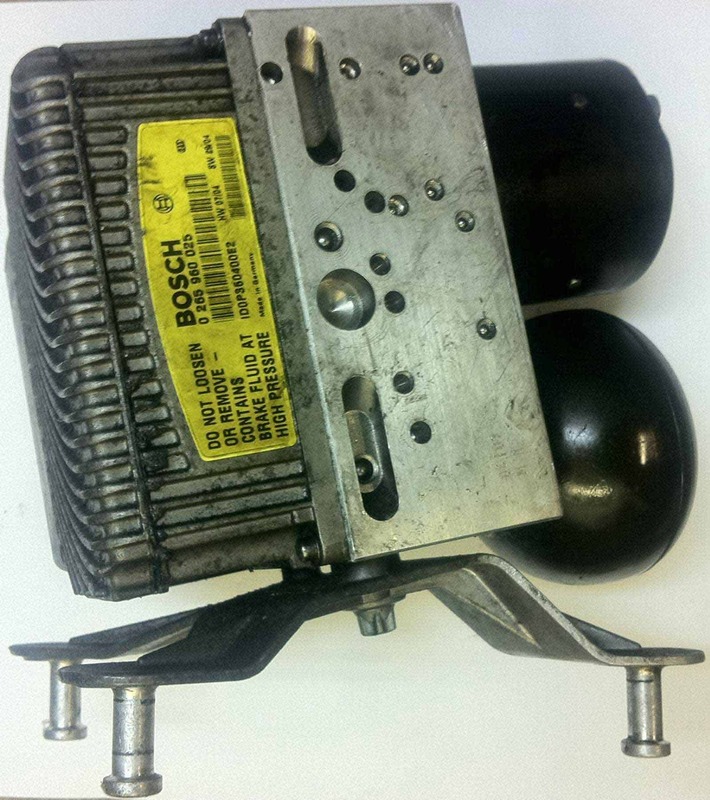 When the Sensotronic Brake Control (SBC) ABS pump fails, you are led to believe that the unit will require replacing and in some cases (depending on the vehicle application) it can cost up to £2500-3000 for a replacement unit (+Labour, Programming & VAT). Connected to the STAR diagnostic system, the fault code C2498 will show the fault code description “Service Threshold Reached” as a current & stored fault code. This code cannot be erased without replacing the system. How Can Sinspeed Help Reduce This Cost & Fix The Problem? Rather than replacing the unit with an expensive new part or even replacing with a second hand part (just waiting for it to fail).. we can remanufacture your existing unit and reprogram the Sensotronic Brake Control (SBC) control module to increase the service life expectancy of the unit. This is becoming a very common problem and we’re able to carry out full repairs to these units and offer a very competitive fitting rate. For more information & a quote, call us today on 0871 2887 666. Tags : 0265960019, ABS Repairs - Call 0871 2887 666 Today, C2498 Service Threshold Reached - Repair Options, Fault Code: C2498 Repair Options, Mercedes ABS Repairs, Mercedes ABS/SBC Fault Code: C249F Service Threshold Reached, Mercedes SBC ABS Life Expectancy Fault, Mercedes SBC Repairs - Call Sinspeed On 0871 2887 666 Today, Repaired SBC ABS Pumps In Stock, SBC ABS Pump 005 431 0012, SBC ABS Pump 005 431 0612, SBC ABS Pump 005 431 3412, SBC ABS Pump 005 431 7112, SBC ABS Pump 0265 250 065, SBC ABS Pump 0265 250 067, SBC ABS Pump 0265 250 077, SBC ABS Pump 0265 250 092, SBC ABS Pump 0265 960 025, SBC ABS Repairs, SBC ABS Repairs - Call 0871 2887 666 Today, SBC Repairs, Sensotronic Brake Control (SBC) Repairs. We have sent you an email requesting some further information, kindly respond to the email and we can then quote for any repairs/replacement where necessary. We’ve sent you an email with some further information and pricing. We have sent you an email requesting some specific information. Kindly respond to our email and we can then quote accordingly for a repair/replacement if necessary. Looking to sort out ABS pump issues on my CLS. Can you help? I have sent you an email requesting some specific information. Kindly respond to the email and we can then quote for a repair/replacement if necessary. My sbc pump isn’t working because I have the red brake light on my dash, I need help asap! I have sent you an email with some further questions, kindly respond to the email and we can then quote accordingly for any repairs/replacement if necessary. We have sent you an email with a few questions. Please respond to the email and we can then quote accordingly for a repair/replacement. We have sent you an email requesting some further information. Kindly respond to the email answering all questions and we’ll come back to you with a quote for repair or replacement. We have sent you an email requesting a little more information. We need to know the colour of the warning light, the exact fault code being triggered, the part number from your SBC unit and whether the brakes are still working at all. Please reply to the email and we’ll be happy to assist you. Control (SBC) control module. The brakes are working fine. Dash shows that the service period is overdue.